In any foodservice application, presentation is just as important as the preparation. This unique, reliable glass decanter allows for pouring fresh, piping hot coffee into your guests' and customers' mugs with ease. A 64 oz. (1.9 liter) capacity can accommodate enough coffee to last throughout an initial breakfast rush or flurry of usual patrons, while the ergonomic handle ensures effortless use. This decanter is a great alternative to the BUNN branded ones which go for a higher price but are of the same quality. The orange handle also helps distinguish between different brews. I use the orange handle decanter for both decaf coffee and hot water for tea. This is a necessity for anywhere that serves a lot of coffee. They clean easily and hold up well. Great product. Great color to tell the difference between regular and decaf. Solid glass build and able to withstand multiple brews consecutively. Fits most commercial brewers. All our glass Coffee Decanters got broken when we moved locations. These ones with the Webstaurantstore logo were very reasonable compared to the Bunn ones and serve the purpose just as well as any decanter. I would purchase them again. Love these coffee pots! They're great and reasonably priced! Thank you webstaurant for a great quality product at a great price! Will definitely be ordering more! Has been dropped and did not break! Cleans easily, no leaks. Perfect for restaurant use as we use it daily and have had no issues with the pot. Works as intended. Great price. A word of caution to future buyers although the decanter is generally durable weird dings tend to shatter the pot pretty easily. As long as the staff isn’t to clumsy they last a long time! Great replacement price! Love the bright orange decanter by the WebstaurantStore because it makes it easy to know the difference between regular and decaf. The price is very low and the quality great. A nice find and will buy more very soon. Great coffee decanter for the money. We use the orange one for decaf coffee and it has held up well through daily use. A great buy! JUST A GREAT COFFEE POT AT A GREAT PRICE. USE THE ORANGE TO DISTINGUISH FOR DECAFFINATED OR JUST FOR COLOR. STURDY ANS MADE WELL FOR THE PRICE. Works great and the best deal on the price. Careful not to fill to the seal, they will drip some around the seal where the plastic meets the glass after some time. it is the perfect decanter for us to server out coffee in and it very sturdy too. it is easy to clean, ships fast, and arrived packaged well. So far so good... I'm nervous when using them though, with all the warning labels on the side. I'm hoping these aren't more fragile than the other decanters I use.... but great price! These are great pots. They don't break easily and stand up to washing in the sanitizers. The orange handle is a must when serving both regular and decaf coffee. Excellent quality. the price is very good. Webstaurantstore logo makes it look so good. i totally recommend it for good quality and good price too. I bought this coffee urn to replaced my old one. Very good quality and bright color. You can make your day better with clean coffee pot! This coffee decanter is wonderful! It has lasted a long time and is so easy to clean. It's nice to have them color coded so you know what coffee is in what container. 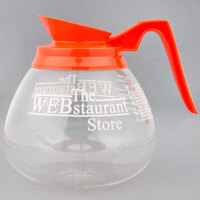 The WebstaurantStore logo glass coffee decanter with orange handle is just like the conventional bunn decanters at a lower price. The orange handle is good for decaffeinated coffee. I have been impressed with the construction of this coffee pot. We bought 2 of these and have used them for a few months now. The glass portion is thick and the handle spout portion is attached well. Great alternative to the pricier Bunn decanter option. Easy to clean, easy to use, and overall a good decision. Would definitely buy again if I needed more. After breaking one of our coffee decanters we had to order a new one, this one worked perfect and fits are machine perfect also cleans easily. This glass coffee decanter works great with our Bun coffee maker. The orange top is great for knowing that there is decaf coffee in the decanter. This coffee pot holds up well. It is easy to clean and it is great product. The price is great in comparison to other places, plus it held up better than a brand named one that cracked being sat down on the sink that I had half the time as this one. I will be ordering another from here to make up for the other one breaking from another brand name place. This glass coffee decanter with orange handle is excellent . The 64 ounce capacity is good for 8 cups of 8-ounce coffee. It fits our coffee maker perfectly. This is a great product and excellent brand. This decanter has lasted us well over a year and is very durable, inexpensive, and is easy to clean and sanitize. A must have, item with an amazing price. An amazing price for these webstaurantstore logo glass coffee decanters that are very well made. These are perfect for having back ups for our decaf brewer. These are perfect for the decaffeinated coffee. It's nice to have the orange handle so you don't get them mixed up. Easy cleaning up. Great for the job!! Great price! The do not leak! Found orange color for out decaf. When they arrived they were wrapped nice and boxed up, No cracks during shipping! We can't be the only place who has the problem of serving freshly brewed tea to a customer thinking it is coffee. We purchased these to brew our fresh iced tea in. Great quality and stylish looking. We ordered two and one was broken upon delivery. Just talked to webstaurant and they are sending me a replacement. Great customer service! The WebstaurantStore Logo 64 oz. Glass Coffee Decanter with Orange Handle exceeded my expectations. I just purchased a BUNN coffee maker and it worked great with it. Easy to fill and pour. Definitely recommend! Great decanter for any coffee pot. Sturdy, light weight, easy to clean and store. Came with my coffee machine but I actually purchased a second because the machine came with 2 warmers. Can't beat the price. I had to get at least one decaffeinated decanter because not everyone drinks caffeinated. Customers don't have to ask if we sell decaf, the orange handle speaks for itself. These are great all glass so you dont have to worry about the seams leaking. They are easy to clean and the top is color coded so you know which is regular, and which is decaf. Traditionally the orange decanters are used for decafe coffee, and we do use them for that. We plan to use this one for hot water only. The price can't be beat either. Good coffee pot at a great price. I would make it 5 stars but the handles don't seem quick as sturdy on these as others I have ordered. These pots clean well and are very economical. We have these orange handled ones as well as the brown handled ones, making it easy to keep the regular coffee and the decaf straight. We needed a new decanter for our bunn coffee maker. The webstaurant brand is so much cheaper (in price) we decided to try it. We love it. We can buy several of these for what a bunn decanter costs. If you can save money and still get good quality. You can't beat that. This is a good coffee decanter. We needed a few extra for our Bunn coffee maker and a decaff model. This works as it should and we are happy with it. We ordered this coffee decanter for decaf in our B & B and it works well to keep it the decaf warm until we switch to the carafes to take it to the dining room. A good choice. Great decanter for a great price. I've ordered decanters from this website on more than one occasion and they haven't disappointed. They're strong and have a great look. Would definitely purchase again. This is a nice Decanter for coffee. We use it for decaf coffee and we have another one of those for regular. The handle is nice and useful when you pour the coffee. Great coffee decanter for the price and the servers really love the different colored handles that make it easy to keep track of what product you have. These are nice quality, sturdy decanters. What I like the best is that the top of the glass is completely enclosed in plastic. This seems to be a weak area on other carafes and the glass tends to crack along the joint there. Hopefully this design will prevent that! this is our second set of decaf decanters, with daily dishwashing and lots of abuse (burning coffee in them overnight) they lasted about 2.5 years! That's a huge value for a small office kitchen that serves over 5 pounds of ground coffee a week. The logo started to wear off so we decided to get new ones, they still could have been used for many more years. Purchased this decanter with a Bunn brew system. Works perfectly. The quality is comparable to Bunn pots. Handle is good, safe distance from the pot itself. Would love to see this pot in blue or green as well as the traditional brown and orange. The thing about coffee pots is to remember which pot has the decaf in it. With the orange handle on this pot you don't have to worry about that. Will buy again!! Great price for these decanters. Very durable and easy to clean. The orange top and handle make it easy to identify that it is decaf. Durable and good quality product . Perfect brewing every time. My servers serve the hot tea and coffee straight from this decanter. Save time from using and cleaning other pots.Easy to clean. Always keep them in stock. I needed new pots and you can't beet the price on this item. washes well. I have hard water and they never have a white film like my old pots got with frequent washing. Nice sturdy coffee pots for all you coffee needs! We use them for coffee and also for brewing our tea. Easy to keep clean also. this is a very nice coffee pot. we always use the orange for decaf at my restaurant and i love the webstaurant logo, we always advertise it at our place! A must have for serving brewed coffee. The orange handle is bright and screams decaf. I could do without the logo, but that didn't stop me from buying it. Since I paid half the price of the BUNN decanter for this one, I can now afford to purchase a replacement decanter! This one is a no-brainer. When you have coffee, you have to distinguish between types by color. A decaf decanter is very distinguishable from regular. This one is sturdy, and a great buy. We rarely need to make decaf coffee but this obviously works well for that as does using it for hot water for tea and cocoa. Durable and easy to clean. A wonderful coffee pot our restaurant has used on a daily basis for almost two years. It is well made, does not leak and holds up to multiple cleanings.